New York, Buffalo & Newark Lawyers - Gorlick, Kravitz & Listhaus, P.C. We are a small law firm founded in 1994 to provide high quality cost effective representation to individuals and institutions in our major practice areas. We concentrate our practice so that we can obtain results for you efficiently and at a reasonable fee. We won’t represent you in areas we don’t have expertise but we will help you find the legal resources you need. Our focus is on you and your needs both legal and practical. We pride ourselves on delivering superior cost effective legal services in our major practice areas. We believe that you are entitled to representation from experienced attorneys who have a superior understanding of the legal issues you face. We believe that hard work and creativity combined equals client satisfaction. By clicking one of the links above, you'll be transported to a more detailed description of the services we offer in these areas. Our clients typically include international unions, local unions, and ERISA trust funds as well as small businesses and individuals. We pride ourselves on the diversity of the clients we serve. 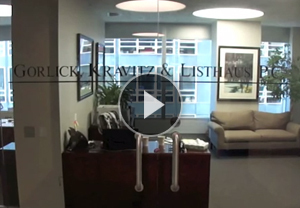 Arrange a consultation to see how Gorlick, Kravitz & Listhaus, P.C. can help resolve your issues. Call (212) 269-2500 or contact one of our attorneys online.